Primary focus is to help people learn to relax and self-regulate. Use is not passive but rather an active process of learning what environmental factors and activities are helpful for the person. Design incorporates furniture, equipment, lighting, and items with sensory interest that a person can purchase and duplicate in the home environment. Protocols are developed to assure safety and proper use of the space. Development and enhancement of therapeutic relationships are keys to the efficacy and value of this space. 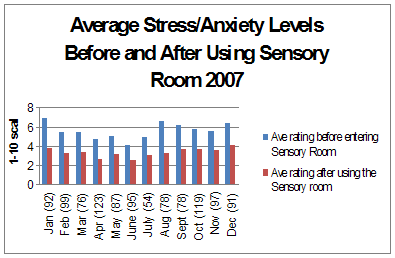 Mental health and developmental disability units throughout the country are discovering the benefit of Sensory Rooms. These therapeutic spaces are designed to promote sensory modulation and facilitate the learning and practice of stress management skills. They offer opportunities for self-discovery and meaningful therapeutic activities. The use of Sensory Rooms for individual and group treatment is being linked to treatment plans for patients with safety and self-regulation issues. Effective utilization the rooms can provide a bridge linking skills learned in the hospital environment to the use of helpful sensory strategies in the discharge environment. Use of Sensory Rooms is being encouraged by the National Technical Assistance Center, a division of the National Association for State Mental Health Program Directors (NASMHPD). Accrediting organizations including the Joint Commision on Accreditation of Healthcare Organizations (JCAHO) are focusing on the efficacy and safety implications of having Sensory Rooms available. Sensory input has a powerful impact on the nervous system and must be used with care and supervision by knowledgeable staff trained in the use of sensory modalities. Multidisciplinary use of the rooms is highly advantageous and therefore proper training becomes imperative. Occupational therapists have a unique clinical background in sensory treatment interventions and play a key role in designing sensory room space and in educating patients as well as staff regarding the safe and effective use of sensory activities and environmental interventions. Respect for the individuality of sensory preferences and adherence to safety precautions are essential. Successful outcomes and patient value of the Sensory Room rely on staff competence and the quality of the therapeutic relationships developed there. Tina Champagne, an occupational therapist from western Massachusetts, was the first to expand the idea of using sensory rooms into inpatient mental health environments. Her extensive experience with sensory rooms and sensory modulation treatment led to her emphasize the important role occupational therapists play in the design and safe effective use of Sensory Rooms in treatment. Her quality improvement studies into the efficacy of the use of the Sensory Room showed positive responses from patients and a significant decrease in their perceived levels of stress. The results of this study were published in the American Occupational Therapy Association's Mental Health Interest Section referenced below. Champagne, T. (2006). Creating Sensory Rooms: Environmental enhancements for acute mental health settings. Mental Health Special Interest Section Quarterly, 29 (4), 1-4. Ongoing efficacy studies on the Sensory Room are being conducted on the Acute Psychiatric Unit for Adults at UMASS Memorial Hospital in Worcester Massachusetts. Data on the use of the room is kept in a log book. Patients keep track of their information on a form which designates which type of sensory input was chosen along with a self rating form which rates their level of stress on a scale of 1-10 before and after using the sensory room. This chart below, reflecting one year of data, and 1,089 visits, shows marked decreases in perceived levels of stress averaging a 38% reduction. Treatment in mental health facilities naturally focuses on psychological issues, however psychiatric illnesses have a physiological impact and also sensory implications. Sensory Rooms provide an environment that nurtures the body and invites the person to engage in activities that help them to feel good and to focus on strengths and interests and personal self care. Activities are success oriented, failure-free and chosen by the individual. For some clients this may mean listening to soothing music, rocking in a chair, relaxing while watching an aquarium display, listening to books on tape, engaging in activities such as word searches, or cuddling up in a beanbag chair. For others it might be a place to use grounding techniques which require alerting stimuli such as a scent box or hot ball candy; once the person feels oriented and grounded, the room serves as a place for self-soothing. Larger Sensory Rooms can have space for simple exercise equipment such as a Bosu Ball (used for balance and toning exercises), exercise bands, and mats for yoga. Ideally the room has a large locked cabinet where a variety of sensory treatment items can be kept that incorporate all of the senses (visual, auditory, taste, smell, touch, proprioception, and vestibular). Example stored items include activity baskets, baskets of stress balls and other manipulatives, aromatherapy supplies, weighted modalities, and items such as a vibrating foot massager. Sensory Rooms vary greatly from facility to facility and can look and feel very different depending on the way in which they are used. A room stocked with sensory supplies can be a convenient place to hold a yoga class or small groups focused on self-regulation such as the Coping Through the Senses Group. In some facilities Sensory Rooms are designed to be safe havens that do not require direct supervision and are open for patients to drop in at any time of day or night. This room might be a place to use a weighted blanket to calm someone in crisis or a weighted "heavy duty dog" used to sooth an agitated patient. For ideas on Sensory Room download this PDF Documentwhich includes ways to use a Sensory Room, ideas on involving unit staff, protocols, space design, furnishings, and suggestions for sensory supplies. Learn what has worked for other facilities. 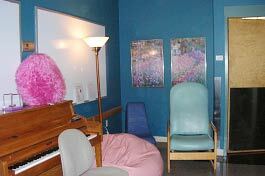 For pictures, stories and studies on Sensory Rooms in a Variety of Mental Health Settings download this PDF Document which includes Sensory Room ideas from the Neuropsychiactric Unit at UMASS Medical Center, UMASS Acute Psychiatric Unit, Westborough State Hospital, and Summit Behavioral Healthcare in OHIO.